JOHN FERRIER was the eldest son, and second of the three children of Richard Ferrier and Margaret Squire of Filleigh on the Barnstaple-South Molton road in North Devon. He was born in the second year of the reign of George I, the first Hanoverian king after the last Stuart monarch, Queen Anne, died. The name appears variously as Ferrier, Farrier, and Ferrer, meaning a farrier or smith. 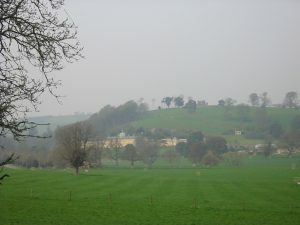 Proutworthy, Winslade and Knowslade all lie immediately to the north of Castle Hill, the mansion and park which were the home of the influential and wealthy Fortescue family. Since John’s father is listed on several occasions as a freeholder of Filleigh, some or all of these Ferrier properties may have been owned by him. John appears to have grown up in a family of farmers of some substance. His father was literate enough to sign his own name. MARY DUNN. Mary’s baptism has not been found, but the Filleigh marriage register of 1743 states that she was the daughter of John Dunn, and that she was then ‘of this parish’. Her mother’s name is not known. There were burials for Catherine Dunn in Filleigh in 1747 and 1752, for Mary Dunn in 1761 and 1699, and for Elizabeth Dunn in 1762. One of these could be Mary’s mother. There are two possible baptisms in neighbouring Chittlehampton. 1713 April 7 Mary Daur of John Down husbandman. The first of these would have been 30 at the time of her marriage, close to John Ferrier’s age. The second would have been only 15. There is another possibility. In 1743 the Filleigh register records the burial of ‘John Nott als Dunn’. There were certainly many Notts in the earlier registers, but the only Filleigh baptism of Mary daughter of John Nott is not until 1732. The Dunns only appear in the Filleigh registers with the baptism in 1734 of James and Isaac, the twin sons of John Dunn. This family is too close to John and Mary’s marriage to be a likely one for Mary’s. In the 1780 Land Tax, a John Dunn was the occupier of Higher Beer. He too may be Mary’s brother. Though he did not own this farm, it was a highly rated property, at £5.12.0, and thus of greater value than the total holdings owned by the freeholder Richard Ferrer. John Dunn rented it from the Rt. Hon. L. Fortescue, the wealthy owner of Castle Hill. It was one of the two most valuable properties not occupied by the Fortescues themselves. Under the Devon system of leases for three lives, a tenancy was often handed on from father to son. If they are related, Mary appears to be from a family of tenant farmers, but ones who could afford a substantial property. They had at least six children, of which four seem to have survived infancy. John lived only a year. He was buried ‘in Woollen only’ on June 15th 1744. The Ferriers were younger contemporaries of Amos and Susanna Fook, who were also raising a family in Filleigh at this time. The first half of the 18th century saw the transformation of the Fortescue estate now called Castle Hill. The name is derived from a fake ruined castle built on the hill behind the house. From 1684, successive generations of Fortescues transformed the medieval or Tudor manor house into one of the largest and most sophisticated mansions in Devon. In the 1730s Hugh Fortescue added new wings to make the house extraordinarily long. The village church was deemed to be too close to the house and in 1732 a newly built church was opened further away from it. The Ferriers and Dunns would have had to make the change to this new place of worship. It is also possible that the main road from South Molton to Barnstaple was re-routed further south. John’s father died in November 1754. He had previously appeared in lists of freeholders of the parish. We might have expected his place to be taken by John, his eldest son. In the 1755 freeholders list, the only Ferrer listed is Robert. We have no other record of a Robert Ferrer in the parish, so this may be a mistake for Richard. In 1762 Richard Ferrer is again listed as one of two freeholders in Filleigh eligible for jury service. It seems reasonable to assume that John had died, and that this was his eldest son and heir Richard, and not his younger brother. But Richard junior was only 18 in 1762, and jurors had to be over 21, so perhaps the property did pass to John’s brother. Either way, John’s name never appears in the lists of Filleigh freeholders. It seems likely, therefore, that John died between 1751, when Thomas was born, and 1762, and perhaps before 1755. He may not have outlived his father. It is possible that he died, or was buried, in another parish. There are burials in Filleigh for John Ferrier in Mar 1785 and Mar 1786. This could well be John and Mary’s second son. The marriage of their daughter Margaret to William Thorne in 1766 was witnessed by ‘John ferrer’, who signs his own name. This, too, could be Margaret’s brother. Mary died in 1763, possibly in her 40s. 1763 Mary Ferrier. Aug 23 63.